There are many ways to do something that matters. Here are two approaches. 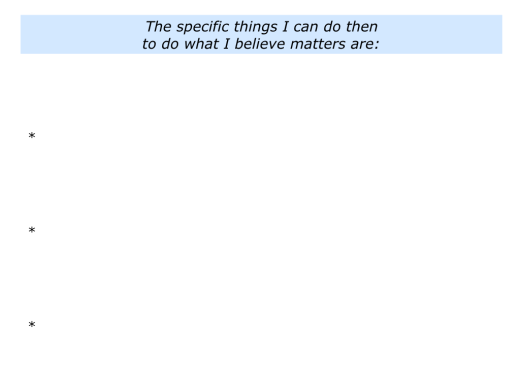 You can do things that you believe matter. You may aim to encourage a person, show kindness, pass on knowledge, coach a sports team, raise money for a good cause, do work that helps other people or whatever. 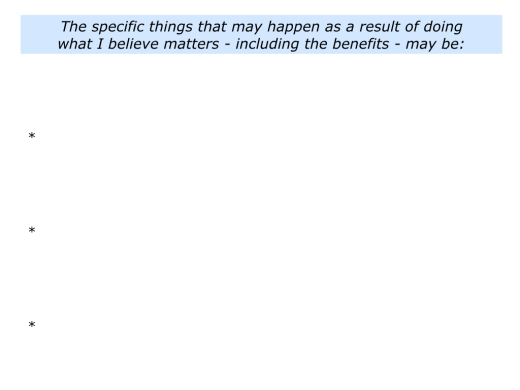 Another approach is to ask a person or group of people what matters for them. You can then aim to provide the material goods, services or knowledge that they would find useful. 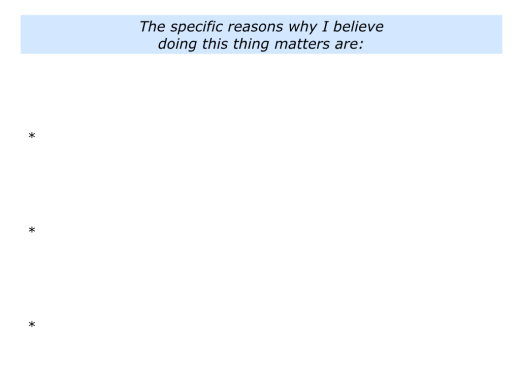 They are then getting something that really matters in their lives or work. Looking at my own life, for example, I spent the years between my early twenties and mid-forties doing work that I believe really mattered. This included running therapeutic communities, teaching people how to build on their strengths, helping people to build super teams and other activities. The learner learns what the learner wants to learn. Certainly I had focused on this before, asking people what they wanted to take away form the sessions. 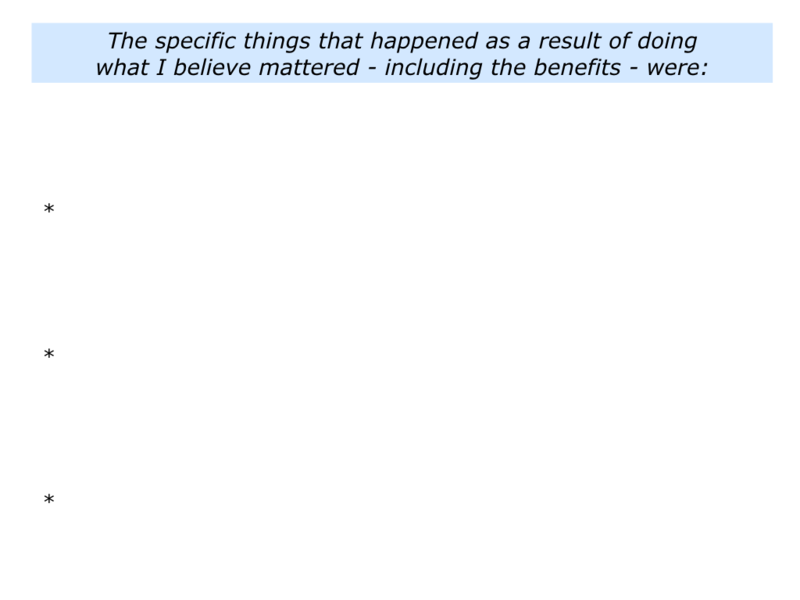 But then I began doing much more work upfront on what really mattered to people. This led to improving the educational experiences. Looking back on your life, when have you done something that you believe really mattered? This could have been something small or large. What happened as a result to taking this step? 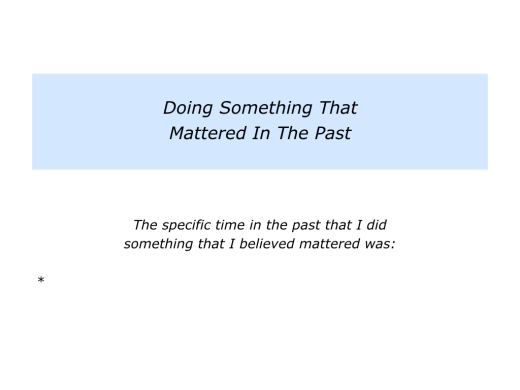 Describe a specific time in the past when you did something that you believe mattered. 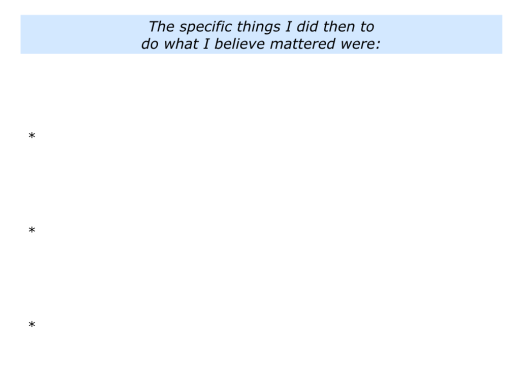 Describe the specific reasons why you believed that doing this thing mattered. 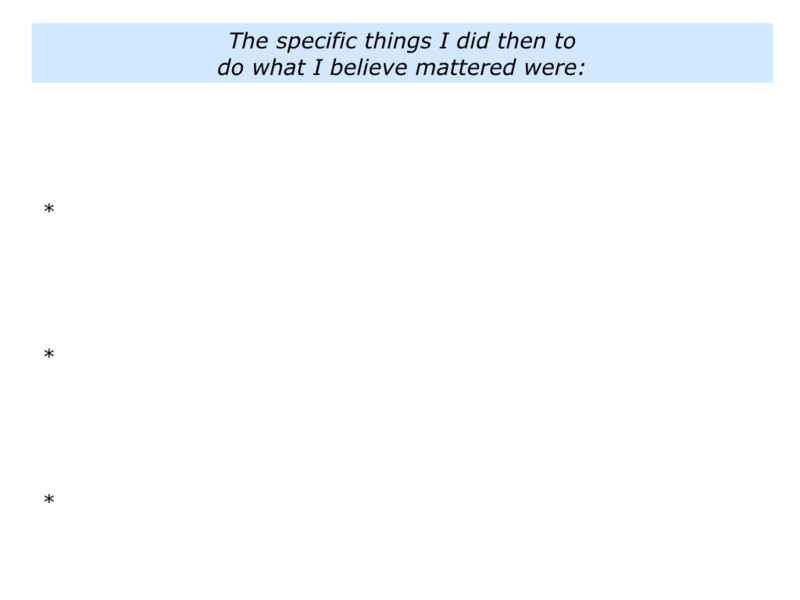 Describe the specific things you did then to do what you believe mattered. Describe the specific things that happened – including the benefits – of taking these steps. Different people do different things that they believe matter. Some focus on being kind and helping other people. However special it may sound it (kindness) is by no means exceptional. On the contrary, it comprises a great deal of human interactions. The fabric of our lives is made of care, solidarity, mutual service. These qualities are so embedded in our daily events that we may not even notice them. Kindness is urgent in our relationship with our living environment. If we do not respect and love nature, do not treat her with loving kindness and the awe she deserves, we will end up intoxicated by our own poisons. It is up to us. It is a choice in the life of each of us – to take the way of selfishness and abuse, or the way of solidarity and kindness. In this exciting but dangerous moment of human history, kindness is not a luxury, it is a necessity. Being kind is taking a stand. By itself it may not help: Maybe our kindness will be ineffective. Never mind. We have affirmed a principle, a way of being. My thesis is that true kindness is a strong, genuine, warm way of being. 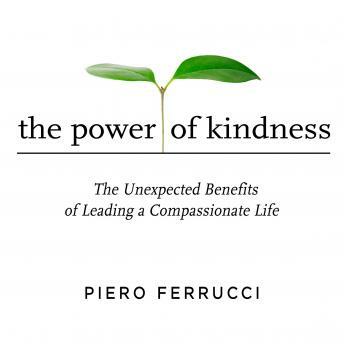 Kindness itself may seem lightweight, and yet it is a central factor in our lives. It has a surprising power to transform us, perhaps more than any other attitude or technique. People often ask me what is the most effective technique for transforming their life. It is a little embarrassing that after years and years of research and experimentation, I have to say that the best answer is – just be a little bit kinder. The Zen Hospice in San Francisco does work that matters. It helps people to feel human until the end of their lives. In the video below BJ Miller describes the project’s approach to facilitating that process. Below are some excerpts from the organisation’s website that provide an insight into its work. You can discover more via the following links. So many of us think of life and death as two separate things. It doesn’t have to be that way. In fact, the two are connected. What if the things we cherish most in life were the same things we carry with us towards death? Those moments that make us feel awake. Loved. Human. What if we could live our lives – fully – all the way to the end? Zen Hospice Project, IDEO and many others are exploring how we might provide the best hospice care possible and design a better experience, for everyone. And we’d like you to join us. We draw from our contemplative heritage and a history of successful collaboration with the hospice and palliative care community. Our legacy of compassionate and pioneering service initially grew from the San Francisco Zen Center in 1987. Since then, Zen Hospice has grown into an independent non profit organization (501c3) providing care at the bedside for those facing advanced illness and their loved ones, while also training and supporting a new wave of volunteer and professional care givers. Zen Hospice opened its iconic Guest House in 1990, as a community-based model to attend to those dying and in most need of support. As an early responder to the AIDS crisis, we provided care when others would not during this era of fear. 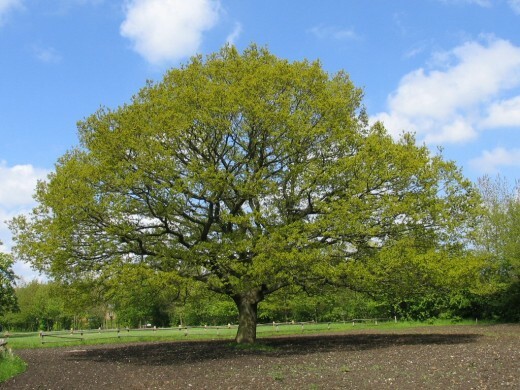 In 2010, Zen Hospice renovated and re-opened the Guest House as a licensed residential care facility for the chronically ill (RCFCI) with 24-hour nursing staff, all of whom are trained in our approach to mindful, compassionate, and skillful care. Since 1988, we have provided the same quality of care at Laguna Honda Hospital, one of the largest public long-term care facilities in the United States. Our volunteers serve daily on the 60-bed hospice and palliative care floor supporting residents and their families, working in collaboration with professional care givers. Today Zen Hospice Project is a thriving organization offering direct care, educational programs, and inspirational support. Serving more than 31,000 people to date, our primary geographic focus is the Bay Area, but our work has gained national and international influence. You will have your own approach to doing things that matter. These may range from small acts of kindness to large projects that help people or the planet. Describe the specific thing you want to do in the future that you believe matters. 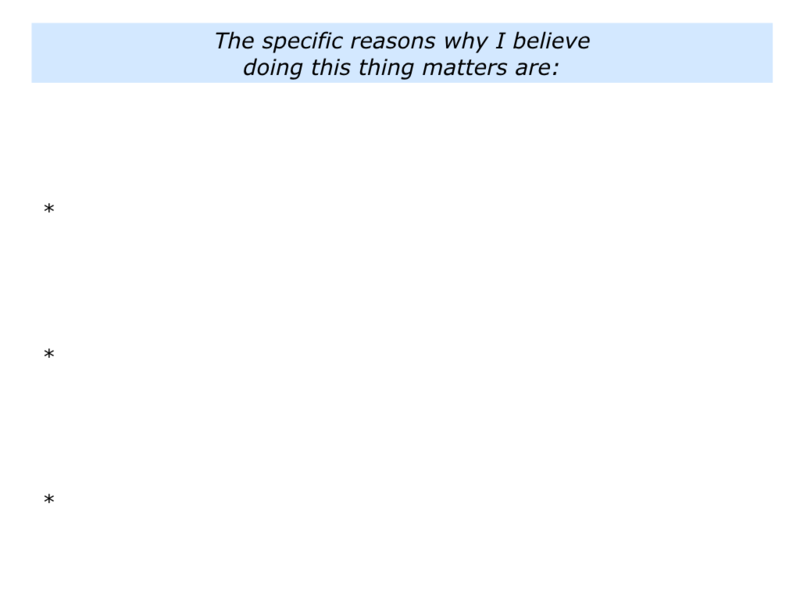 Describe the specific reasons why you believe doing this thing matters. 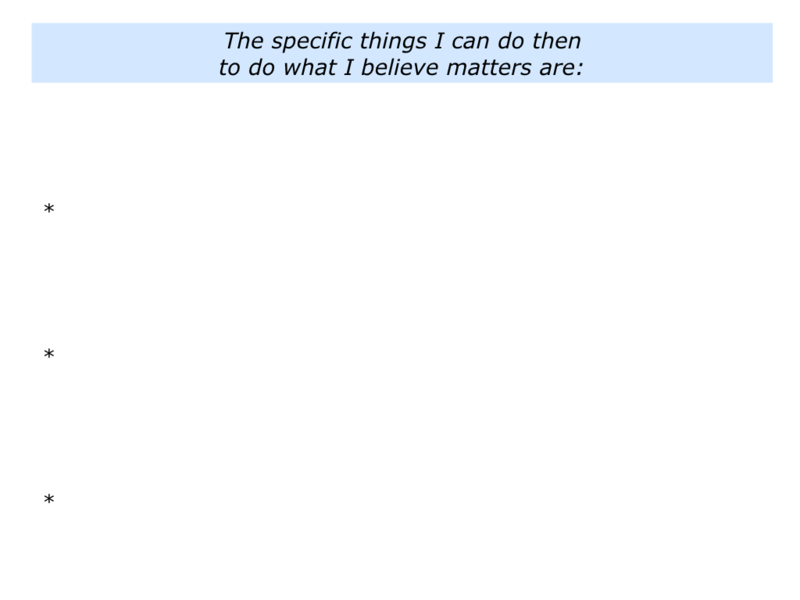 Describe the specific things you can do then to do what you believe mattered. Describe the specific things that may happen – including the benefits – of taking these steps.